Aw. 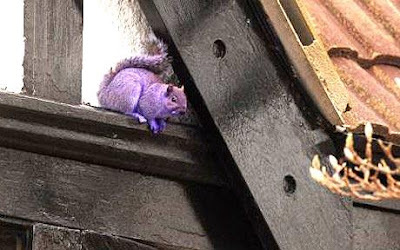 I wish my school had a purple squirrel. I wish it was a blue squirrel. What are your theories, Kirsten? DI: EITHER school officials are using the purple squirrel to distract the students while mind-control drugs are ground into the kids' lunches OR it escaped from an alien zoo ship. It's probably the only nice squirrel in existence, and the other ones turned it purple as punishment. They were eyeing me today. I think I'm next. It's an alien, sent to warn us of an invasion, but we don't speak his language, so we'll DIE! Because we won't know it's coming. I think some evil genius was experimenting on the squirrel and while trying to make it like a chameleon so its fur could change colors, he accidentally turned it purple. That or its part Farrie. maybe he ate too much eggplant??? photoshopped. It just looks photoshopped. I also agree with Nellie. and online s/he made it purple.